The other night my son came over and wanted to smoke a cigar, and split a beer with me. This is not an unusual event, as Dad is an endless supply of beer and tobacco, or so they think. But there was a difference. Usually I have my cellar beers, and my “available” beers. This night I decided to mix it up, and I told him to grab any beer he wanted. Taking full advantage of my momentary lapse in sanity my son immediately went for the cellar beers. 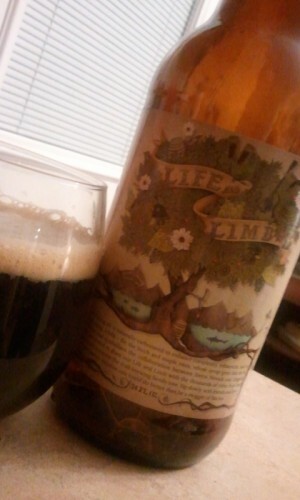 At first he came out with my corked version of Life and Limb from 2011, and I told him that I had a 2010 version that had been aging for over a year and a half, why don’t we drink that one, and let this one age a bit more. He happily agreed and went back to the cellar and found this brew. This Life and Limb poured a very dark brown, and when it was all together in the glass I wasn’t able to see any light through the body of the beer, just a reddish hue around its edges. This was a real eye opener for my son that specifically selected it because it said “ale” so he was thinking that it would be a lighter beer. His education continues and now he knows that “ale” can be anything from very pale in color to very dark almost stout like. It had about a one finger head that quickly dissipated. The body was malty and a bit sweet, then the birch came through with all its complexity, and flavored this brew like a birch beer. You know, kind of like a root beer. It had an interesting aftertaste that reminded me of the old 10 ounce sodas my grandfather used to get, you know the ones that were delivered in a wooden case and had the clear bottles with white paint that created the label. This was a really nice beer as it began to warm up a bit and open up. You could really taste the ale base as this happened and it reminded me somewhat of North Coast’s Old Stock ale. I really enjoyed the flavor, and the birch did give it a bit of wood flavor too. Jim would say popsicle stick, but I don’t mind that flavor a bit, must be all the whiskey I drink. Pleasantly at the end the alcohol combined with all the flavors here to make it a touch boozy and warm. Perfect for the cool evening in the garage (I don’t get to smoke in the house). This beer was a real treat, and I really am glad I opened up my cellar for consumption. This beer aged very nicely, but I think it was just about done, as I can’t really see how additional aging would benefit this beer any more. Looking forward to the 2011. I think I may have to crack that one open pretty soon to do a comparison. Well done on informing the next generation. I drank a 2010 right when it came out and it was just a touch hot. Nice to know it smoothed out with some time. Yeah, it just has character now. If you wait too much longer it might get a bit muddled. Really nice now, though. And how did the progeny like the darker-than-expected ale? Actually we had very similar thoughts about the beer. It was solid, and a really fun brew. I’ve had this one too–the 2010 version–and really enjoyed it. I too like that root-beer/birch beer kind of sensation that you get with it. I didn’t get any hints of “popsicle stick” though. It was just a touch of popsicle stick, not anything that detracted from my enjoyment though. Nice review, Don. What I’m wondering is how the beer has changed with time. I’m assuming you also tasted the 2010 fresh? I’m sure it’s great, but in what ways has it improved? A comparison would be pretty awesome. I never got to try the 2010 myself, but I’ve had a few 2011s, which I loved, and I have a pair in the cellar as well. I wish I got the chance to try it fresh, but never did. From what others are saying it was a bit hot and not as well integrated on the finish as it is now. Kudos on actually allowing an age able beer to age thoroughly. I have yet to achieve the level of patience necessary to accomplish such a feat. I’ll have to keep an eye out for the 2012 version. Fall release? Don, I know this is a bit off topic, but have you had any of the whiskeys from High West? Nope not yet. Are they the distillery in Montana? I’ve heard great things about them. I really enjoy the fact your son is coming to his old man looking for good beer. I think my first drink with my pops was Crown Royal. Ugh. I enjoyed Life and Limb this year but I wish I would have aged it now. That sounds like a future post to me … What was the first beer you ever tried with your dad/parent etc.? Mine would be … Ballantine Ale. As you say … ugh. PBR for me and Jim. That is partly the reason we didn’t like beer for a long time! Good idea. Maybe today. First beer with the Folks was Yuengling and now I have no taste for the stuff… guess I snuck too much of it over the years….